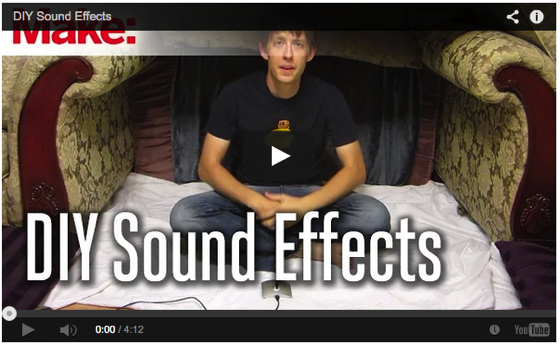 Here are my favorite shared new media items for May 2012. I had a great time recording 3 episodes of New Media Tea Time on Friday with Tracy Pattin and Danielle Gruen. The first episode has just been released. You can watch it below or subscribe to the New Media Tea Time podcast in your RSS Reader. You can receive Careers in New Media content directly in your email box. Use the form or link below to subscribe via email. I have a regular monthly meetup with a couple other new media minded friends and today an interesting topic arose. All of use use WordPress to host one or more of our blogs. During the conversation we fell upon the topic of WordPress Database backups. If you use WordPress, it is imperative that back up this database regularly as it contains all your blog content. Unlike a typical web site made from static HTML pages, WordPress stores all of its content in an SQL database. If you are new to WordPress, or your blog was set up by your web designer, you might not even realize this. This is where a lot of people run into trouble. Typically, it isn’t very easy to back up this database, even though it is critical. Most explanations talk about logging into the database using phpMyAdmin and performing a manual series of steps. This is clearly beyond the abilities of many bloggers, who just want to write their blog, not become a sysadmin, as well. That said, there is an easy way to backup your WordPress Database and store it away for safekeeping — automatically. WordPress Database Backup is a great plugin that works automatically and will even email you your database so it can be backed up with your normal PC files. In my case, I setup a seperate Gmail address that collects and stores these backups in case I ever need them. While the WordPress database is extremely important, you will also want to back up all the WordPress files in your blog directory using standard FTP tools. These contains all the source code, theme files, plugins and more that allow your blog to operate in conjunction with the database. Backup your WordPress database today and regularly. If you don’t know how to do it, contact your web designer or web host and have them assist you. You don’t want to lose your blog to a preventable error. This new product from Samson seems an odd duck. 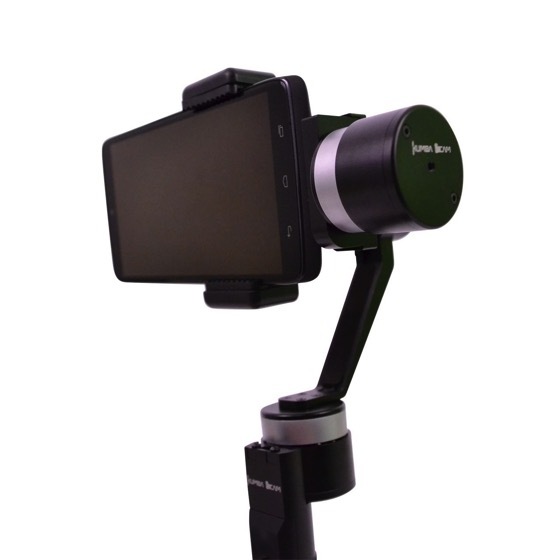 It looks like a Flip video grafted onto a Zoom H2 recorder. While that is certain to up the audio quality, the standard 640 x 480 video falls short of the Flip HD. I will be more interested to see the next revision of this device. Our Battlemodo showed that while cheap pocket camcorder video quality has come a long way, audio quality is usually abysmal. The Zoom Q3 aims to change that with TWO directional microphones that can be focused much like a lens zooms. For our February 11th OC Podcasters meeting we have a speaker lined up, Douglas E. Welch. We’re asking that you PLEASE RSVP so we can get a headcount for how many will be attending. How to use social media, in all its forms, to support your podcast, without going mad in the process. During the discussion of at the November Geek Dinner, it came to mind that a new group would be beneficial to the various groups (tech and otherwise) that exist in LA. I saw a deep need for an “organization of organizers” — a group where organizers could turn to help one another build their groups and work together on projects of common interest. In this vein, I am proposing the LA Organizers Consortium. Based on this description, we certainly could use an association of groups to forward any number of common goals. 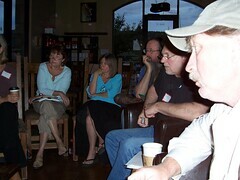 Create a comprehensive schedule listing all LAOC member events on our own site and develop groups on the various event sharing and promotion sites, such as Upcoming,org, SuretoMeet.com and others. I am sure there are other benefits that others can offer, as well. It is my feeling that we have done very well in starting and developing a large number of groups in LA and no we are ready to take it to the next level of organization. Through the Consortium we can start to bring our power to bear to create even more and better effects in LA. If you are an LA Organizer and would like to become part of the Consortium, you can join the new mailing list/group I have started. Please forward this note to other organizers you may know, of the organizers of groups of which you might be a member. You can also subscribe to this calendar directly using RSS or iCAL. As I read through my RSS feeds each day, I always find a number of interesting items. Google Reader allows me to easily “share” these items, both within Google Reader itself and at this web page and RSS feed. To the right you will find a widget containing my latest “Noted” items and a link to see even more. I found them interesting and I bet you will, too! Subscribe to the RSS feed to track what I find interesting every day. 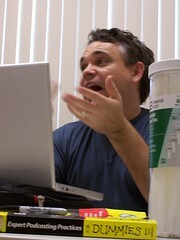 Another photo from PodCampAZ I just discovered while searching through Flickr. 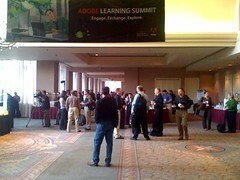 I am here in San Jose for the DevLearn conference and was able to check out today’s Adobe Learning Summit as well. Big crowd here to learn about all sorts of Adobe tools to assist them in their eLearning careers. Get on over to the registration page so we know you’re coming. I captured this photo Evo Terra, Podcasting for Dummies and Expert Podcasting Strategies for Dummies author, as we were recording podcasts during the Gangplank Hackmania night on Wednesday night. 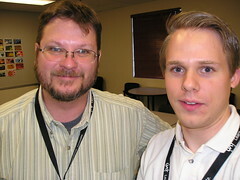 We had a great time, as always, and I always enjoy my limited time with the podcasting and tech folks here in Phoenix. I’ll be back in November to speak at PodCampAZ..
Tim Street, creator of French Maid TV, points out in his blog that the iTunes Podcast Directory now has a split between audio and video podcasts. While this might help some folks, I am worried that that it might make it harder to find shows. The way it currently works is a bit confusing, as you have to choose Video or Audio first, then a cartegory to see specific shows in a particular category. I am not sure how they could have arranged it otherwise, but it might leave some novice users missing one type of show or the other. Interesting change, we will just have to see how it works out. Wow! Tonight’s New Media Interchange meeting was better than I could have ever expected. 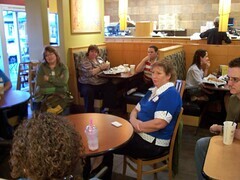 We had a great group of people and so much conversation that the staff at Panera Bread was shooing us out the door long after official “closing” time. I only had time to take a couple of pictures, but you can see them all on my Flickr page. Just click the photo to see more.